The February 5, 2015 issue of the Troy Times-Tribune is available. 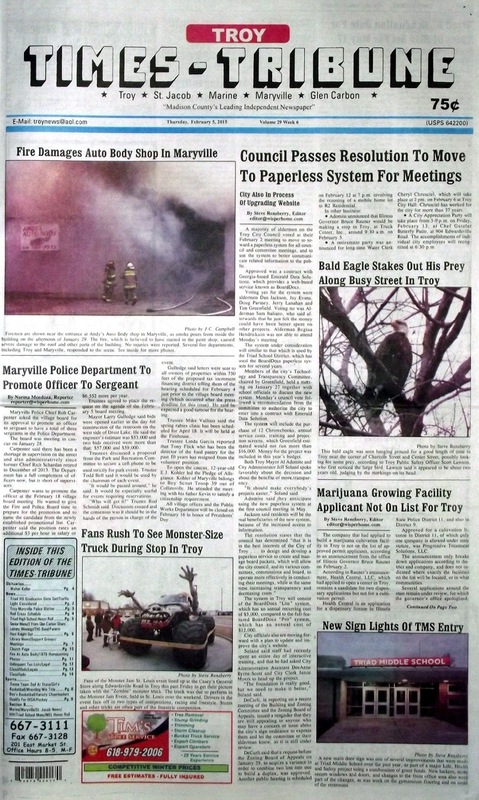 Some of the stories in this issue: Troy Council Passes Resolution to Move to Paperless System for Meetings, Maryville Police Department to Promote Officer to Sergeant, Marijuana Growing Facility Applicant Not On List for Troy, Triad HS Graduation Date for Class of 2015 Set for May 17, Traffic Light At Springvalley and Route 40 Under Consideration, Two From Glen Carbon Share $1 Million Lottery Winnings, Dance Team Second At IHSA State Champion, Triad Wrestlers Win MVC Wrestling Title, Lady Knights Beat Columbia and Upset Highland; plus we have police blotters, our regular “It Happened Here” history page, an editor's column about keeping your cool when it comes to fire, and a photo spread about a fire at Andy's Auto Body in Maryville. We have an obituary for Walter Keller.